Queen's achievement placed it amongst a mere half dozen or so bands across the globe that managed to sell more than a quarter of a billion discs, and turned rock performance into an art form. 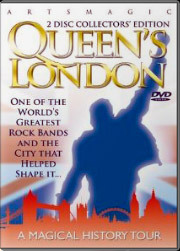 The members of the band came from across the country, and in Freddie's case, from across the globe. But it was in London that it all came together for them, and it is their London we invite you to visit with us. Our hosts in this London tour are Paul Bird, Queen guru, and Jacky Smith, founder of Queen's International Fan Club and its prime mover for the past 25 years. We visit the places where the boys lived, including Freddie s last home, the pubs and colleges where the band first came together, one registry office, their recording studios, and their major London venues. Our guests include Gary Langan, the legendary musical magus who produced 'News of the World' and 'A Day at the Races', Peter Hughes, managing director of Trident Studios and Peter Freestone, one of Freddie's closest friends who nursed him through his final illness. With their help, we have produced a fond guide to Queen's London!